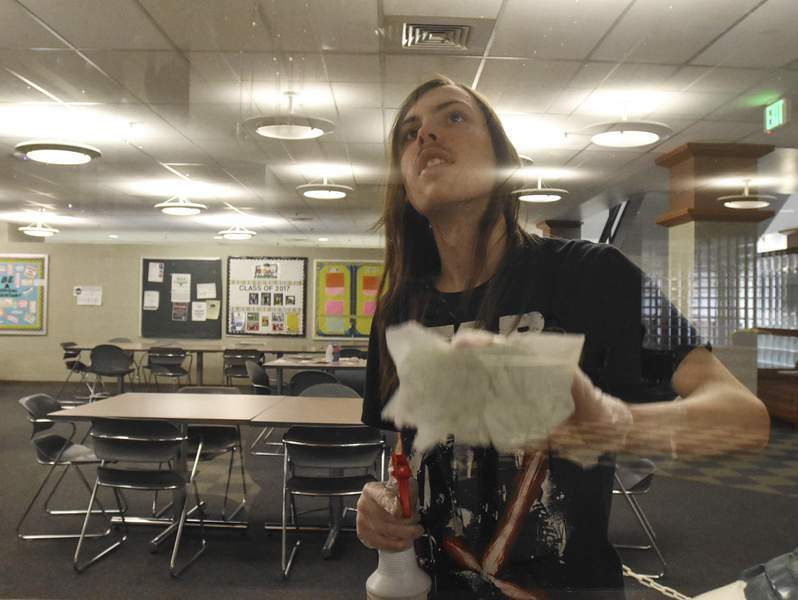 Photos by Michelle Davies | The Journal Gazette Peyton Hullinger, a sophomore at Wayne High School, cleans windows at Ivy Tech as part of the pre-employment program. The program, provided by Easterseals and Goodwill, is designed to prepare students for life after school. Wayne senior Adrianna Malone wipes down tables recently in the lounge at Ivy Tech's Coliseum Campus. Like any other students, they have goals and aspirations. They play sports, attend dances. But special education students face special challenges. A teacher shortage affects their education. High school graduation changes threaten their future. Employers often overlook them. The Journal Gazette continues its special series that focuses on these special people. For students Peyton Hullinger, Trayvon Nickels and Adrianna Malone, Ivy Tech Community College offers an unorthodox learning environment: hallways and common areas dirtied by daily use. 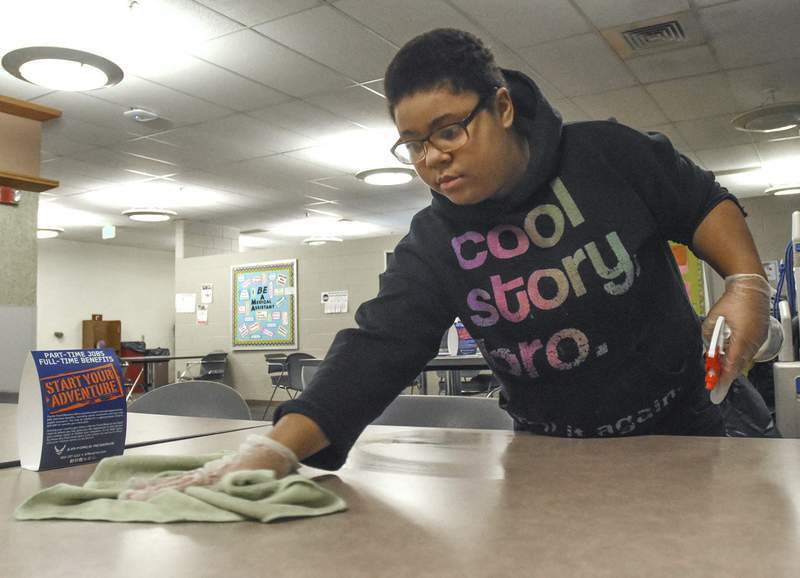 The Wayne High School students regularly visit Coliseum Campus to perform housekeeping duties and other tasks as part of a pre-employment transition services program. Wayne offers the program through partnerships with Easterseals Arc of Northeast Indiana and Ivy Tech. “I treat them like they are my employees,” job coach Lucas Crager said as he supervised the students' progress one Thursday morning in March. The pre-employment program, offered at high schools in 87 Indiana counties through various providers, helps students with disabilities prepare for adulthood. It provides five core services, including job exploration counseling, work-based learning experiences and workplace readiness training. “This is kind of that bridge between school and adulthood,” said Thomas Summerville, vice president of employment and community supports at Easterseals. Easterseals and Goodwill Industries of Northeast Indiana provide the pre-employment program to Allen County public schools. Summerville and others said the program is especially needed now because there's a new gap in employment services for people with disabilities. With demand outpacing the state's resources for vocational rehabilitation services, the Bureau of Rehabilitation Services received approval from the Rehabilitation Services Administration to implement an order of selection Aug. 1, 2017. This requires agencies serve those with the most significant disabilities first. The growing pre-employment program is customized to fit the needs of each school, so it will look different at Wayne than at Homestead High School, Summerville said. The goal, however, is the same: prepare students for employment. At Wayne, program coordinator Ashlyn Smith doesn't baby the students. She teaches soft skills and has expectations similar to those in the workplace. “Everything we do is about work,” Smith said. Students – many of whom aren't on a high school diploma track – are making progress, Smith said. Their confidence is up, communication skills have improved and they know job options aren't limited to fast-food restaurants. Smith and Julie Siebenaler, student transition coordinator at Goodwill who works with East Allen County Schools, have exposed special education students to jobs at hotels, grocery stores, dairy farms, garment cleaners, the airport, and other businesses. “It's really opening their eyes,” Smith said, noting students previously didn't understand what a career was. Siebenaler said it's important to keep students in touch with reality. Students can discover whether their aspirations are realistic by researching a job and required skills and education. For unrealistic pursuits, Siebenaler will suggest students consider related but more attainable jobs. For example, she said, those wanting to be a veterinarian could work in an animal shelter. Résumés, job applications, interviews, customer service and life skills, such as stress management, are other topics Siebenaler addresses. Students learn to use public transportation and, in some pre-employment programs, earn a stipend in such places as Ivy Tech. There, Wayne students have gained experience in administrative services, catering/culinary and groundskeeping. Equipped with cleaning supplies – including disinfectant, brooms, paper towels and trash bags – the trio of Wayne students worked their way down Ivy Tech's Coliseum Campus. They emptied garbage cans, wiped down drinking fountains, cleaned windows, straightened chairs and vacuumed under Crager's supervision. “Did you guys get all the cobwebs?” the job coach asked in one hallway. Crager said the experience is more about showing students potential jobs. For students with verbal issues, he said, it's improved communication, such as knowing when to say, “excuse me,” while navigating hallways with the cleaning supply cart. The stipend is a “great confidence boost” and can help with financial skills, including how to cash a check, Crager said. Stipend amounts vary by program. “Every $20 I get, I save it,” said Nickels, a junior. Nickels, who stooped to gather some trash from the floor as Malone vacuumed, said the program has changed him. He communicates better and has learned about job possibilities, he said. Siebenaler, who is in East Allen schools daily, has also seen students excel. One student struggled with eye contact and confidence, she said, but has been exceptional in the workplace.